Reduce driveline vibration on lifted vehicles with this Heavy Duty Slip-Yoke Eliminator Kit for Jeep's NP231J transfer case. Transfer case tailshaft length is reduced by 6.5" on '97-'06 Wranglers and 4.25" on '88-'95 models resulting in improved driveline angles. Kit includes a redesigned transfer case mainshaft which is not only shorter but has an 18% larger spline diameter, a 54% increase in torque capacity. 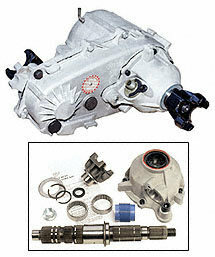 ***Requires a longer driveshaft, which is available separately Only works with NP231 transfer case.